Mahalepi is basically corn flour custard in a sweet rosewater cordial. It also may contain local strawberries or cherries macerated in a spiced syrup. Mahalepi is a popular dessert in Cyprus. 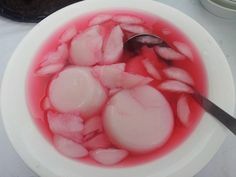 It is usually served on a hot summer's day with extra sugar and rose water as a cold refreshing dessert. This sweet dessert originated in Cyprus, but has versions in neighboring countries in the Middle East such as Lebanon and Turkey. In Turkey and the Turkish part of Cyprus the dessert is known as muhallebi, muhallabia, mahallebi or mahallepi. The name means 'custard' in the Turkish language. It is served in many versions, e.g. with chopped pistachios sprinkled on top (Lebanese style), date syrup topped with walnuts (Israeli style), or with water in place of milk (Turkish: Su muhallebisi, Greek: mαχαλλεπί του νερού (mahallepi tou nerou). Flavorings such as vanilla, orange water, and rose water may be added to the pudding. 6 cups of water, 6 heaped spoons of corn flour or nisiaste (maize powdered starch), rose water or rose syrup, sugar. Put 5 cups of water in a pot and on fire. Put the 6th cup of water in a bowl and stir in the corn flour. Add this to the pot and stir constantly until it starts to bubble and thicken. Let it simmer for a couple of minutes, stirring continuously. Rinse 6 small bowls under cold water (you need them to be wet). Put a scoop of mixture into each wet bowl. Allow to cool, then place bowls in the fridge. The next day, take a big bowl and fill it with cold water. Take your mahalepi bowls and tip each one out into the bowl with the water. Place back in the fridge and use when required. Serve each mahalepi in a bowl, sprinkled with a spoonful of sugar and a spoonful of rosewater. Rose syrup can be added too. Tip: for extra fragrance and sweetness, add 4 tbsp rosewater and 2 tsp sugar in the 5 cups of water before boiling.